Most backpackers who complete a thru-hike of the John Muir Trail eventually come to the decision that they want to do it again. Some come back year after year, racking up thousands of miles between Happy Isles and the summit of Mount Whitney. I can’t imagine ever being bored with the hike, but I can imagine – after a few trips – wanting to do something different that still included much of the JMT. Here are four ways you can tweak your 2018 JMT hike to make it seem new. Switch directions. Most first-time JMT hikers go southbound, and there are lots of good reasons to do so. Several years ago, almost all JMT thru-hikers started in Yosemite. But, as permits to enter the wilderness from Happy Isles get harder and harder to obtain, more people are starting at Whitney Portal, or south of Mount Whitney, and heading north. The trip reports I’ve read all have encouraging things to say about hiking in this direction. Many mention that some of the passes are easier to negotiate and that the scenery looks much different. Also, if you start at the portal, you will be exiting the trail 4,000 feet below where you started. In many ways, your hike will get easier each day. Start someplace else. Have you hiked in Yosemite extensively? Do you know the trail between Happy Isles and Tuolumne Meadows like the back of your hand? Why not avoid the crowds, make permitting easier, and see some new sights? I am a big fan of the Isberg Alternative. You can even start at Red’s Meadow, hike north, take the bus back to Red’s Meadow from Yosemite Valley, and then hike south. Looking for more of a challenge? How about starting at Ebbetts Pass and heading south? Starting there would add between three and six nights to your standard JMT hike, but it would also be uncrowded and beautiful. Take some side trips. The very best way to plan some side trips off the JMT is to consult Elizabeth Wenk’s fifth edition of her book: John Muir Trail: The essential guide to hiking America’s most famous trail. Starting on page 209, there are thirteen pages devoted to peaks you can bag, spots with amazing views, and – best of all as far as I’m concerned – uncrowded lake basins where you are likely to camp alone. Do it faster – or slower. Just hiking the 211 miles and climbing the eight major passes is sufficient challenge for this little guy, but if you are of a mind to really push yourself, why not step it out a bit? I believe the unsupported fastest known time is about three-and-a-half days. If you are going to bring a team along to support you, and you are looking for a record, you will need to finish the entire trail in less than two days, nineteen hours, and twenty-six minutes. There is no need to try for a record, though. My unscientific opinion is that anything less than a week would put you in the top 1% of JMT thru-hikers. A more intriguing option, at least to me, is to take a little more time (instead of a lot less). Why not spend a whole day exploring the upper end of Lyell Canyon, or the shores of Thousand Island or Garnet Lakes? Other places where I could easily spend a day are: Lake Virginia, Bear Creek, Marie Lake (maybe two days there! ), Evolution Meadow, Lake Majorie, and Rae Lakes. As I get older, the idea of walking less and spending more time in my camp chair, with some good food (thanks, Inga! ), and a great view appeals to me. Perhaps it would to you as well. For those of you who have hiked the trail more than once or twice, I challenge you to recall how amazing the John Muir Trail was the first time. Trying one of these suggestions might give you a chance to relive that experience and add to your Sierra Nevada repertoire. Great ideas, as always, Ray. Love your inclusion of Bear Creek. When I hiked the JMT in 2012, Edison Lake was empty, so no ferry to my resupply point at Vermilion Valley Resort. Skipped Silver Pass and turned west over Goodale Pass toward Vermilion (that year, at least, a poorly maintained and marked trail I’d only recommend to experienced mountain hikers). When I left Vermilion, an employee drove me to the Bear Creek trailhead for my walk back to the JMT. That hike alongside Bear Creek was sublime. Bear Creek is a gorgeous, trout-filled creek along which I had to stop repeatedly for photographs of waterfalls and shimmering pools. Nice campsites with water and mountain views. Yes, bear and mountain-lion tracks. It’s high on my list of places along the JMT that I want to return to with family or friends. As some of you know, I have been working on my version of this approach for a couple of years. I call it a John Muir Route after the only sign on the trail with that wording, the one at Rafferty Creek junction in Lyle Canyon. The idea is to find any route between Yosemite and the Whitney region, within the High Sierra, using as little of the JMT as possible. There are dozens of sections, and probably hundreds of different combinations, to accomplish this. I did Part I of my first JMR this year, from Glacier Point to Pine Creek: Isberg/Hemlock to Red’s then the Rainbow/Fish Creek Goodale alternative to VVR, Bear Creek to Hilgard, Italy Pass, Pine Creek, parallels the entire northern half of of the JMT. 135 trail miles, crosses the JMT 3 times, exactly two miles hiked on the JMT. Next year I will do Part II, exactly where I left off at Pine Creek to Piute Creek jct, then south over a series of JMT sections and bypasses that coincide with a little more of the trail than the northern half, 30 something miles, but still parallel and bypass most of it, including 3 of the 5 major passes, (or 4 of the 6, if you count Trail Crest) crossing the Crest 6 times including the resup. ANd ++ to the comments Bear Creek. If I had done the original routing of the JMT, It would have skipped the Bear Ridge switchers, crossed Vermillion Valley and taken the present Bear Creek cutoff. And I’ll take Italy Pass and Pine Creek Pass over Selden and MTR any day. This is a fabulous idea, Peter, and I am enormously intrigued. Do you have any electronic miscellania you could send me showing the route? (.gps or .kml file?) Thanks a bunch for the comment. Yes, but why would I spoil the fun that way? Part of the beauty of this approach is that all the electronic gimcrackerie is largely unnecessary, especially on the northern half. Every inch of the route I took this summer is mapped. Anyone can put it together from the verbal description. Some of it is in disrepair , and a little hard to find on the ground, as you know from having done the Isberg/Hemlock alternative, but the route itself is all there in CalTopo and many other systems, including USGS quads. South of Pine Creek, I would say 90 percent of it is mapped trail, and what isn’t is a couple of short stretches that are easily connected and has at least tracks available on Caltopo. But the greater point is that this approach – not providing the step by step – puts a lot of the fun back in the planning and the hike itself. When I write this up, there will be a data base and app, but it will be more like a video game than a mile by mile guide. More like an Erector set, or SImCity. A large part of the joy in this for me is putting together the route and savoring the research and self-education involved. I am working on putting together a set of tools for this, and others may become developers packaged routes for still others. 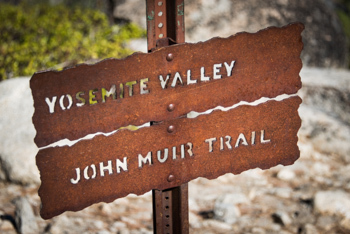 I am happy to suggest certain intriguing sections – and there are some particularly challenging ones – that can be included in a John Muir Route, but there are far too many possible variations and combinations to make any given one of them worth depriving you of the joy of putting one together. How many JMT hikers know for example, that there are at least six trailed passes over the park boundary between the Merced and Tuolumne drainages on the north/ and the Owens and San Joaquin drainages to the south and west, all of which lead to miles and miles of well-marked paths south other than the JMT? Now, south of Piute Creek, the story changes a bit. Its a little harder to avoid the JMT in the south , especially at Muir and Pinchot Passes. Even the Sierra High Route uses about 30 miles of JMT, and except for that, my JMR will not take any of the SHR. I don’t have it completely set yet; there are a lot of options I am still looking at, particularly for the bypass of Forester. Sounds like a wonderful project, Peter. Good luck…I look forward to the results!